Do you want to visit Alamosa like you know a local? Here is your chance! Enjoy the following feature articles writtten by a traveler enjoying some hidden (and not so hidden) treasures around the San Luis Valley. One Colorado mountain town has a sign between the post office and their one tavern that reads - "On this site, September 15, 1890, nothing happened.' Good humor, though something had to have happened, if for no other reason than someone was there to document that nothing happened. From the western movie The Man Who Shot Liberty Valance—a story about the fictitious town of Shinbone coming of age in an unnamed western state over many years—an eastern newspaper reporter and his editor listen to Jimmy Stewart recount his journey as a young lawyer in the territory and how he came to serve as governor, then become a US Senator for several terms and become a vice presidential candidate. The turning point early on in his career, which led to his fame, had been a gunfight where he shot and killed Liberty Valance, one of the stereotypical bad guys that stood in the way of progress in our western territories. When Stewart's character recounts that the shooting was not all his doing, the editor states matter-of-factly that "This is the west sir, when the legend becomes fact, print the legend." What does this have to do with Fort Garland, Colorado? Historical facts and legends have passed through Fort Garland. But history in the west in the 1800s has been skewed, skewered, shrouded, and exaggerated and in the process, created legends and making historical facts less than accurate. Forts have been a part of westward expansion since Europeans hit the eastern shores of the United States. Forts became homes to soldiers and settlers and a place for protection from 'bad elements,' whether it was American Indians having to attack a fort to protect what they believed to be their territories and livelihoods, or, it was often foreign countries in political struggles with new Americans fulfilling the loose, misunderstood, and controversial concept of 'manifest destiny,' whereby American Settlers believed they had the right to expand the new country all the way to the Pacific Ocean. Which meant overrunning Indian tribes and moving the survivors to reservations, fighting with Mexico and booting out claims by France, Britain, Russia, and Spain. In perspective, New Mexico and Arizona were still territories and not states until 1912. Fort Garland opened in what was then the territory of New Mexico until 1861 when the Colorado territory was created. Forts began in the San Luis Valley when Fort Massachusetts was built in 1852, six miles north of the present day town of Fort Garland. Built of wood and located next to Ute Creek, Fort Massachusetts proved to be too swampy and isolated to help settlers in the valley, and too vulnerable to attack from the Ute Indians who were not happy about their valley being invaded. By 1856, a new fort was planned and being built. Occupied in 1858, Fort Garland was built with adobe, as the local Hispanic populations had been using adobe successfully from New Mexico northward. As artisans of the craft of adobe construction, they were recruited to help build the many buildings that became Fort Garland. Fort Garland's role in American History became significant for several reasons. I am lucky enough to have two ancestors who wrote diaries. My great great grandfather served the Union in the 30th Iowa infantry division. He enlisted in August of 1862. Earlier that year in the month of March, the Confederacy, in an attempt to help fund the war effort against the Union, sent an army up the Rio Grande Valley through New Mexico territory from El Paso, Texas toward the gold mines in present-day Colorado. Two-hundred Union Soldiers stationed at Fort Garland made a cold snowy trek south through the mountains to aid other Union Forces in stopping the Confederates. The Union was successful at the battle of Glorieta Pass east of Santa Fe. The Confederates were stopped from ever reaching gold and they were stopped well short of another goal of securing the southern parts of New Mexico, Arizona, California and the port of San Diego, and making all of that strategic land part of the Confederacy. Had the Confederacy been able to secure those goals and fund the war effort, the US might not be a united country. My great grandfather fought to take Vicksburg, Chattanooga, all the battles for Atlanta, and go on Sherman's (Uncle Billy they called him) March to the Sea. Had the South been able to secure more resources, Union Soldiers would have faced perhaps, a very different, well supplied army. My great grandmother, as a young girl, was moving to the midwest from the East coast in July of 1863 and passed through Gettysburg where two weeks earlier, yes, the Battle of Gettysburg took place. Her grandmother had hidden in the cellar for three days and when she emerged after the battle, she found three unexploded cannonballs lodged in her house. My great grandmother became a Methodist missionary in the fall of 1887 and was sent to Tucson. Had Arizona become part of the Southern Nation, northerners may not have been allowed. So Fort Garland has played an indirect role in my history. NOTE: I make reference to Southern Nation as I had been to a 150th anniversary battle reenactment in Resaca, Georgia (battle took place in May of 1864) in which my grandfather fought and I talked to a southern re-enactor. He was wearing a US brass belt buckle upside down. He told me that Confederates would strip dead Union soldiers of their buckle and wear it upside down for Southern Nation. A US belt buckle is on display at Fort Garland museum. Fort Garland played another critical role one year after the battle of Glorieta Pass preserved the West for the Union. Beginning in March 1863, people in the nearby valleys and the SLV were being murdered for no explainable reason. The bodies were also being mutilated. Finally, after one attack, one person was able to escape and identify the killers. Felipe Espinoza, his brother, and a cousin were carrying out the murders to avenge deaths of relatives and because they felt that their lands which were Spanish Land Grants recognized by the United States Government were stolen or squatted upon illegally. As the story (legend?) goes, Felipe Espinoza had been a child in Vera Cruz Mexico during the Mexican War of 1846-1848. The US Navy spent several days shelling the city from the Gulf of Mexico and when Felipe had been away, six members of his family had been killed in the shelling. Escorted by a nun, a young Felipe had to identify the badly mutilated bodies of his family which later manifested into a killing spree of his own, vowing to kill 100 anglos for every family member, including the governor of the Colorado Territory at the time! After the war, Kit Carson became the commanding officer at Fort Garland in 1866-67 before retiring for health reasons. He died a year later but leaves his legend, legacy and name on many things; a town, a mountain, a National Forest, a county, etc. His life and legend had been highly inflated by the dime store novelists at the time who were giving readers in the East nearly unbelievable tales of Carson's adventures in the West. Though he had done his share of Indian fighting, he was instrumental in helping the Utes make an attempt at peace with the settlers and miners moving into the San Luis Valley in large numbers. The history in the San Luis Valley in the 1870s became a serious clash of cultures. After Carson and Chief Ouray of the Utes died, and with the continued inflow of people, peace between the two groups eroded. By 1876, African American soldiers of the 9th and 10th Cavalry divisions were stationed at Fort Garland. They had the difficult duty of trying to get the Ute Indians onto reservations. The Buffalo Soldiers were a mixed group of free blacks who had fought in the Civil War and those who joined the army after the war to receive an education, develop stronger self images, and live a life in the Army that was better than the life from which they came. Segregation was reality as was the prejudice they faced, but history shows they were good soldiers. Apparently the name Buffalo Soldiers came from the Indians with whom they had to fight and interact. Indians could see that the Buffalo Soldiers were fierce fighters and in a term of respect, considered them fighters like wild buffalo. Also, the curly African American hair reminded them of the hair between the horns on the buffalo. The name Buffalo Soldiers stuck. A visit to the Fort Garland Museum helped me to understand the westward expansion of the US a lot better, painting a vivid picture of the fort's role. The museum is just south of Highway 160 on Highway 159. And though, in its 25 year history, when in 1883 the railroads were moving in and the fort was no longer necessary, there were 'boring' days when not much happened besides staying warm in the winter, feeding the horses, going through drills, and performing other soldier duties, Fort Garland played an important role in history. If mountain biking, rock climbing, bouldering, hiking, trail running, geology, panoramic views, relaxing around a campfire, star gazing, seeing wildlife, photography, or any combination of these are desired pleasures â€“ then Penitente Canyon turns them all into treasures! One nice pleasure in the San Luis Valley (SLV) is that the highways and side roads are all easy to travel, mostly flat and straight. All the roads go somewhere! However, the distant views are deceiving because they look two dimensional. The mountains cannot hide, but only by being in them can the true treasures of their hidden, and seemingly desolate canyons, be found. Penitente Canyon could be discovered accidentally but it is best to plan your excursion to this natural geologic amusement park! Additional information â€“ About 27 million years ago a volcano, now known as the La Garita Caldera, went KABLAM! Since that time Mother Nature has used her tools of snow and rain and wind and water to creatively sculpt some of the resulting rock piles tossed around after that monstrous explosion. Known as Fish Canyon Tuft, the rock has formed into perfect walls for all levels of climbers and bouldering specialists. There are bolts in place for over 300 climbs. No waiting lines! With routes named 'Nature of the Beast,' Squidbelly Phlemfoot' to 'What the Hey' and 'Passion Play' how could someone not have fun in this canyon? No equipment no problem. There are places to climb that are low to the ground (known as bouldering). Trails through the canyon are for climbers to get to their routes but these trails also lead up and out of the canyon. Above the canyon is a maze of interconnecting trails for hiking, trail running, mountain biking and exploring. With a bit of trail courtesy, everyone gets along! Driving to Penitente Canyon â€“ Off of US Highway 285 18 miles North of Monte Vista, 17 miles South of Saguache take signs for La Garita and brown sign for Penitente Canyon â€“ follow signs, the pavement will end but the dirt roads are generally in good shape, sometimes dusty, occasionally wet. Find a designated parking place and prepare for fun. 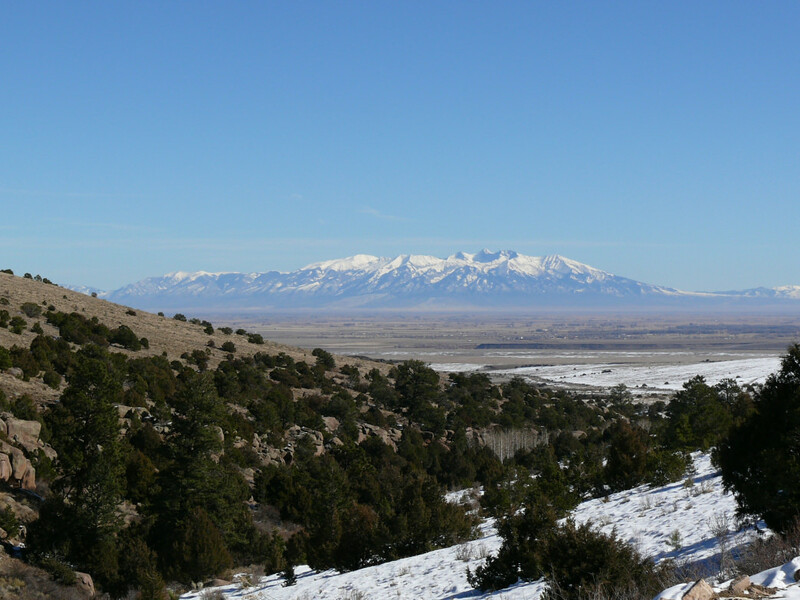 Pleasures â€“ The expansive views across the valley from Penitente Canyon to the East are the Sangre De Cristo Mountains nearly 50 miles away! Scenery changes from season to season and hour to hour as the sun, clouds, and light play upon the deep bluish gray rocky peaks and their steep dark green forested hillsides that bottom out on the valley floor. In the evening the peaks (if still covered in snow) begin to glow and turn colors from french vanilla, to tangerine, to a darker orange to a blood red, for which they are named. (Sangre de Cristos = blood of Christ). The weather at 8,000 feet can be pleasantly warm in the intense sun but there is plenty of shade in the cool shadows of the rock formations and the aspen and pine trees. What better treasures in life are there than enjoying Mother Nature's playgrounds? Pursuits of passion in natural surroundings add a comfort to life that only nature can truly provide. When was the last time you did something for the first time? Imagine having a base camp with family and friends. Walk the canyon and watch climbers on their routes up a rock face. May give you the desire to try it. Meet new friends. Cruise the trails on foot or on mountain bikes. Lots of new trails and loops and it is difficult to get lost! Do a few laps and come back to camp. Spend the day or several. NOTE: - There is a small store in La Garita but if you plan on being there for camping, you will need to stock up your ice chests, food containers, and gear in Alamosa or another town beforehand. The trails are not groomed and there are a few technical places that are steep, rocky, and rooty. There are yucca and cactus lurking on the edges of the trails â€“ that's where the stick and stab comes in! And don't forget ticks, mosquitoes and other biting insects may be wandering about. Be wary of all these possible perils, proceed with excitement and caution, and you will soon discover why Penitente Canyon is one more treasure in the San Luis Valley. The San Luis Valley is home to countless trails for hiking, biking and running. We've compiled a list of the trails less traveled, an insider's guide to 5 trails you need to be on- because you probably haven't yet! Make Alamosa your basecamp for a variety of different trails and terrains. Before you go, check out all your dining and lodging options. Now, map out your weekend so you can hit as many trails as you can! If you’ve spent any time in Colorado, you know the Centennial State takes its beer just as seriously as its outdoor pursuits. With nearly 300 craft breweries statewide, the possible combinations of awesome hiking, biking, paddling, and climbing, followed by your choice of incredible microbrew, are nearly limitless. Nowhere is this more apparent than in the San Luis Valley, where you’ve got thousands of square miles of playground, including Great Sand Dunes National Park, the Sangre de Cristo and San Juan Mountains, and the Rio Grande River, just to name a few. Here are a few of our favorite trail-to-ale pairings to get your creative juices flowing. Thanks to its proximity to New Mexico, the San Luis Valley shares many of its signature flavors with its neighbors immediately to the south. Traders and merchants used the Old Spanish Trail, along with several other major thoroughfares, to move goods between the San Luis Valley, New Mexico, and California, spreading cultural influence throughout the American Southwest. The SLV is also part of the region where the chile pepper was born: Bred by horticulture professor Dr. Fabian Garcia in 1913, the green chile is among the most beloved southwestern staples. You’ll find some of Colorado’s best local foods in this agricultural haven. Thanks to its agricultural background, the San Luis Valley is home to tons of unique local flavor. Though the region is technically a high-altitude desert climate, it’s fed by an underground aquifer and regular spring runoff from the nearby mountains. The valley is known for its production of potatoes, lettuce, spinach, carrots, and quinoa, all of which thrive at 7,600 feet above sea level. It’s also home to free-range bison and Rocky Mountain White Tilapia. Fortunately, much of the food that’s grown in the San Luis Valley stays there. Head to the Alamosa Farmers’ Market (held downtown at State Avenue and 6th Street) every Saturday from July to October for fresh regional produce and baked goods. You’ll also find cooking demos, kids activities, live music, and other cultural events to make it a great way to spend your Saturday morning. There’s also the San Luis Valley Food Co-Op, where you can find local meat, eggs, dairy, grains, and seasonal produce year-round. It’s member-owned, but anyone is welcome to shop at the co-op. For your sausage needs, check out Gosar Ranch Natural Foods, which has been making sausages with the same preservative-, nitrate-, and additive-free recipe for six generations. There’s also a flour mill at its Monte Vista headquarters. Plenty of San Luis Valley restaurants serve local fare, too. Head to Locavores for fresh, local ingredients paired with a focus on Indonesian cuisine and a commitment to environmental sustainability. It’s motto is "modern cuisine, local produce," and classically trained chefs Eelke Plasmeijer and Ray fuse Indonesian flavors and dishes with local produce, often grown in their own garden. The restaurant features solar panels on the roof to supply much of its electricity, and all the edible kitchen waste is fed to pigs on their farm or composted for the garden. The menu is filled with unique dishes that are bound to impress. 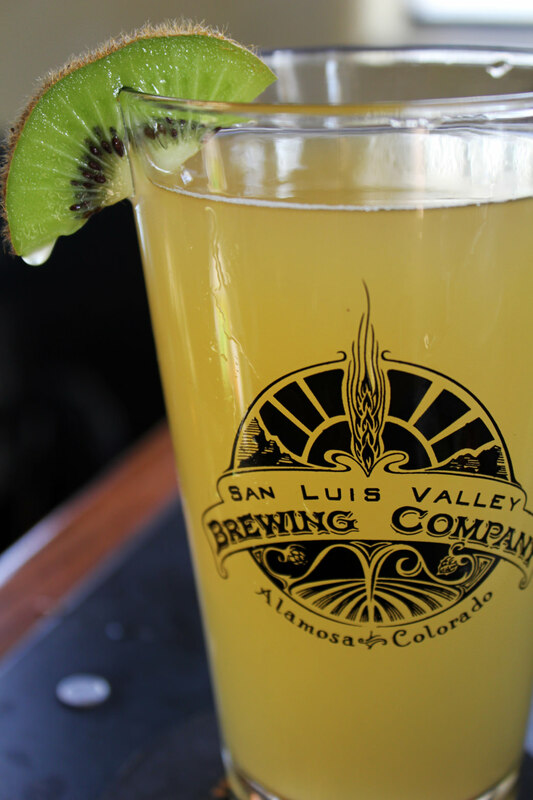 Another must-visit spot is the San Luis Valley Brewing Company, which offers both locally made beer and food in an inviting setting. Scott and Angie Graber brew the beer on the premises, which is an 1897-built building that was updated to a modern restaurant and brewery in 2006. The centerpiece of the restaurant is a 5,000-pound vault door from 1912 that "is a reminder of what the brewery is about today: quality, craftsmanship, and using raw materials to make something wonderful." The small-batch beer list changes, but some favorites include the Valle Special, a Mexican-style lager, the Hefe Suavé, an American style wheat beer, and the Alamosa Amber, a classic Colorado red. The menu is filled with comfort food done well, and includes a bison chili, burgers, sandwiches, pasta, and steaks. Seafood lovers should try the Colorado stream trout served over quinoa. Next door to the the brewing company, The Roast, also run by the Grabers, features ethically sourced coffee as well as libations. It’s the perfect spot to grab a pick-me-up to start your day. Originally written by RootsRated for Alamosa CVB. Nothing says fall better than a seasonally flavored latte. Alamosa offers three great locally owned locations for that perfect fall brew (Coffee, Latte ). Below are three favorite fall favorites, but don't just take our word for it, go out and enjoy for yourself! Blessed Brews Coffee Shop 2431 Main St. The blend of pumpkin, white chocolate & cocunut is perfect for a crisp fall morning. Just a sip and you can almost imagine the crunching of leaves beneath your feet. Looking for something filling to pair with this latte? Check out their baked good section! The Roast 420 San Juan Ave. The mood and atmosphere alone will put you in the fall mood. From the smell of freshly roasted coffee beans to the unique gowler lights, the roast is a sure fall favorite stop. For those warmer fall days try this creation. Sweet & refreshing with a little flair! Milagros Coffee House 529 Main St.
On the corner of Main and State in Alamosa you might be inticed to explore the sounds and smells of Milagros Coffee house. A popular hangout for those roaming downtown Alamosa and a great stop for a break from shopping. Try the Pumpkin Pie Latte for that traditional twist on fall. All three coffee houses offer a variety of flavors for the fall season. Stop in and taste for yourself! For years, visitors have been sledding down the dunes in plastic toboggans, rounded saucers, and even cardboard. As most visitors soon found out, the saucers and cardboard did not work at all. Adventuresome and creative people soon developed boards specifically made for sand, featuring extra slick bases. These new boards are the ideal tool for surfing down the dunes. Sandboarding, sledding, and skiing are permitted anywhere on the dunefield away from vegetated areas. The park does not rent or sell sandboards, but they can be rented at Kristi Mountain Sports, (719) 589-9759. Did you know? The oldest rocks in the park are metamorphic (biotite schist and gneiss) estimated at 1.7 billion years old, making them some of the oldest rocks within the National Park System! Experience the beach like nowhere else on earth, surrounded by majestic mountain peaks and the stunning beauty of the dunes. Medano Creek is a popular seasonal stream enjoyed by all ages. The creek runs intermittently—depending on the season—at the base of the dunes. Expect the most water in late spring and early summer. Bring beach toys, sunblock, and plenty of drinking water. Click here for current creek conditions. Explore any part of the 30 square mile dunefield you wish; there are no designated trails in the sand. A dunes-accessible wheelchair is available for free loan at the Visitor Center. In summer months, plan to hike the dunes in morning or evening to avoid 150F degree sand temperatures or thunderstorms. Great Sand Dunes National Park and Preserve is open 24-hours-a-day, every day of the year. You can hike on the dunes at any time and explore any part of the 30 square mile dunefield you wish; there are no designated trails in the sand. There are a variety of other hiking options as well; forested trails, alpine trails, grasslands, and wetlands. The region's geology and biology make it unique among our national parks and a fascinating place to explore. You can choose a day hike or stay overnight in the backcountry. Find everything you need to know to plan your excursion here. Great Sand Dunes National Park and Preserve is open 24-hours-a-day, every day of the year. A free permit from the Visitor Center is required if you plan to camp on the dunes at night. Free backcountry permits are also required for overnight backpacking trips originating in the national park. Inquire at the Visitor Center for site availability, current conditions, and your permit. Please note that permits must be obtained in person during Visitor Center hours: 9 a.m.-6 p.m. in the summer; 9 a.m.-4:30 p.m. in the fall, spring, and winter. Permits are not available in advance, or after Visitor Center hours. Plan to use Leave No Trace guidelines. Medano Pass Primitive Road (high-clearance 4WD vehicles required) roadside camping is only permitted at 21 marked, numbered campsites in Great Sand Dunes National Preserve (part of the Sangre de Cristo Wilderness, beginning 5.2 miles from where the pavement ends in the National Park). These sites are indicated with a brown post and camping symbol and are free of charge on a first-come, first-served basis. All 21 sites fill on summer holiday weekends, and often on other summer weekends. Piñon Flats is a National Park Service campground located one mile north of the Visitor Center, open April through October. You can make a reservation here. Individual campsites have a maximum capacity of 8 people, 2 tents, and 2 vehicles (including towed vehicles/trailers). A 50% discount applies to senior pass and access pass holders. Oasis Campground - located just outside the national park entrance. 90 sites total: RV sites with full hookups, tent sites, and camping cabins. Showers, laundry, restarurant, and store on site. Open April through October. Follow the link or call 719-378-2222. Zapata Falls Campground - primitive campground on Bureau of Land Management (BLM) land, located 11 miles south of the park Visitor Center, at 9000 feet in elevation. Spectacular views of the entire dunefield and valley. No water; pit toilets; fire rings at each site. $11 per night. Open year round; dirt road is not plowed in winter, but many vehicles drive on it, packing down the snow. San Luis State Park Campground - located 15 miles west of Great Sand Dunes Visitor Center. 1-800-678-2267 for reservations, 719-378-2020 for ranger station in summer. Hookups available. No trees in campground. Lake is absent in dry years. Wetland area closed to the public for nesting season February 15-July 15. Sand Dunes Swimming Pool and Campground - privately owned facility located 30 miles west of Great Sand Dunes Visitor Center, 2 miles north of Hooper, CO. RV sites with hookups, tent sites, cabins, geothermal swimming pool, organic produce, salads and hot food items. Open year round, 719-378-2807. KOA Alamosa Campground - 34 miles from Great Sand Dunes Visitor Center, 4 miles east of Alamosa. RVs, hookups, tents, cabins. Open warmer months only. Reserve: 1-800-562-9157 Info: 719-589-9757. Blanca RV Park, located 27 miles from Great Sand Dunes Visitor Center. in town of Blanca. 719-379-3201. UFO Watchtower and Campground - located 32 miles from Great Sand Dunes Visitor Center, located north of Hooper on Hwy. 17 Open year round. 719-378-2296. If you find yourself passing through the San Luis Valley in winter, perhaps on your way to a ski resort or playing in the backcountry, the Great Sand Dunes are an excellent choice for a rewarding photo shoot. The dunes are one of those rare places for outstanding photography on any given day under all conditions. Start with whatever camera you have available including digital and cell phone cameras. It's simply a matter of seeing the shot and fearlessly shooting at will. Sometimes out of a hundred pictures three or four absolute treasures will emerge. With today's digital technology it is easy to do that, so fire away! Sunrises, sunsets, galaxies, and clouds that morph and dance across brilliant blue skies provide an ever-changing backdrop to the dunes. Dazzling and magical are accurate descriptive terms of the sky over the dunes. No light pollution! The Great Sand Dunes provide excellent conditions for star and moon viewing. Star viewing is best on moonless nights. Star charts are available at the Visitor Center. Great Sand Dunes National Park is open year round with the scenery and landscapes being equally as breathtaking in winter as in summertime visit. Just a short drive from I-25 to Hwy 160 west leads you to the San Luis Valley and Great Sand Dunes Country. From Hwy 160, outside the small town of Blanca, Hwy 150 heads north right to the Sand Dunes. As you near the entrance to the Sand Dunes, the cascading slopes of snow covered sand magically appear against the bright blue winter sky. Although sunshine is generally abundant, temperatures will be cool so be sure to dress in layers. Even in the wintertime, a short walk out to the base of the dunes is a must! While at the Dunes, be sure to stop into the Visitor Center to check out the informational exhibits. Close to the Sand Dunes, you will find Zapata Falls. Even in the wintertime, the falls are a site to behold! A short, uphill walk will lead you the falls, but be very careful, once you reach the stream, it will be icy and slippery. The falls freeze over in the wintertime offering amazing photo opportunities or even ice climbing for the more adventurous! After an invigorating day enjoying the great outdoors, head to the Sand Dunes Swimming Pool, for a relaxing swim and soak. The hot well water enters the 150,000 gallon pool at 118 degrees and the pool's temperature is maintained between 98 and 102 degrees depending on the season. The adjoining 24 person therapy pool stays a consistent 108 to 109 degrees. Once thoroughly relaxed, drive on in to Alamosa, check into your hotel, and enjoy a great dinner at one of our many restaurants.